On visiting UNHCR’s Bangkok detention camp, Lord Alton found that the UK Home Office’s Country Information and Guidance Report on Pakistani Christians and Christian converts, which states that such individuals are not at “a real risk of persecution”, was being used to justify unduly prolonging granting asylum to Christians fleeing Pakistan. 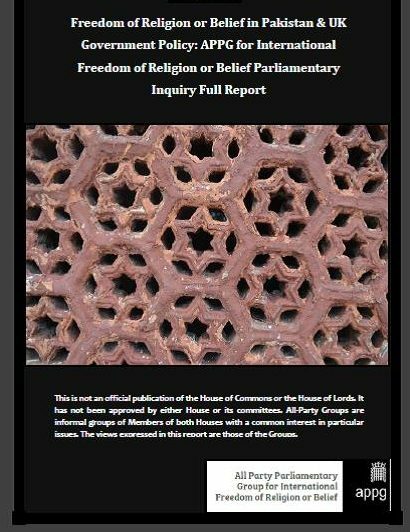 The APPG for International Freedom of Religion or Belief subsequently launched an inquiry into the treatment of different religious communities in Pakistan and the adequacy of current UK Government policy regarding these communities. The APPG’s three-month long investigation and analysis drew on evidence from over 20 organisations, lawyers and academics and resulted in the publication of a report, launched in Parliament on 24 February 2016. The report challenges the Home Office’s Country Information and Guidance on Pakistani Christians and Christian converts while also finding that Ahmadis, Christians and Hindus in Pakistan face a real risk of persecution, the likelihood of which depends on their encounters with and actions amongst people of other faiths or beliefs. The APPG inquiry’s main findings and recommendations include an urgent requirement for a new country guidance report regarding Pakistani Christians to provide sufficient and accurate guidance for Pakistani Christian asylum cases. At the very least, the APPG urges the Home Office to limit the use of the current AK and SK country guidance case in its Country Information and Guidance (CIG) report on Pakistani Christians and Christian converts to be used only for cases involving Evangelical Christians and blasphemy charges from non-State actors. In the report, the APPG urges the Home Office to acknowledge the strong evidence highlighting Pakistani authorities’ failure to protect minority religious communities from rights violations and amend its CIGs accordingly. The inquiry also highlights concerns about the possibility of internal relocation of Pakistani religious minorities, which the APPG urges the UK Home Office to recognise as unsafe and unviable. Home Office staff involved in asylum cases, including interviewers, interpreters, case workers and presenting officers, should be sufficiently sensitised and trained in the different religious doctrines and terminologies of religious denominations in Pakistan, as well as the cultural contexts which have enabled and supported the persecution of members of Pakistan’s minority religious communities.